Ancient Greece is traditionally regarded as the muse of Western culture. “The dome of Thought,” wrote Lord Byron, as he contemplated the ruins of a Greek temple, “the Palace of the Soul.” Not surprisingly, the early leaders of the Metropolitan Museum of Art emphasized classical art. Visitors entered a museum resembling a temple. They were met by two out-flung architectural arms: To the right lay Pharaonic Egypt, to the left Greece and Rome. Then, at mid-century, in an action that now seems farcical, a Met director who didn’t much care for classical art turned the centerpiece of the Greek and Roman galleries—an atrium designed by McKim, Mead & White that evoked the garden of a Roman villa—into an undistinguished restaurant. The Met suddenly looked gimpy. Its Egyptian arm might still beckon nobly, but Greece and Rome heralded a clink-and-clatter cafeteria. The Egyptians offered food for the soul, the Greeks served up tuna-fish platters. This historical injustice has now been redressed. 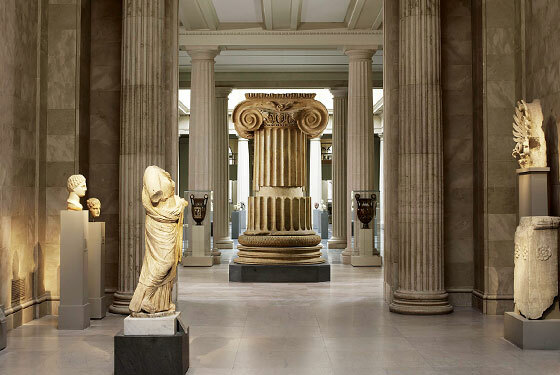 Next week, in the environs of the original McKim, Mead & White atrium, the Met will open the last rooms of its spectacular redesign of the Greek and Roman galleries—the conclusion of a fifteen-year project overseen by the Met’s chief curator of classical art, Carlos Picón. (The new galleries contain, in addition to well-known works, about 6,000 objects previously in storage.) Now, when viewers enter the museum and look left, they will see a glimmer of light at the end of a grand hallway, an invitation to enter the classical world. As they walk down the navelike space—the Mary and Michael Jaharis Gallery, illuminated with natural light, opened in 1999—they will come upon Greek sculpture from the sixth to the fourth century B.C. and eventually arrive at the massive column from the Temple of Artemis at Sardis. Just beyond is the new Leon Levy and Shelby White Court, the focal point of the just-opened galleries. The Levy court remains faithful in spirit to the original, classically inspired McKim, Mead & White design. Its atrium rises two stories under a glass skylight; about twenty Roman sculptures dating from the first century B.C. to the second century A.D. stand on a new, handsomely patterned marble floor. The court has neither the fey, ironic quality of most postmodern architecture nor the staginess of the J. Paul Getty Museum’s copycat Roman villa in Los Angeles. It’s simple. It’s stately. It evokes but does not imitate a Roman garden. (A fountain—modern, but with a classical accent—adds an ageless melody.) Nothing looks as it did before: The art seems to have emerged from a dull yellow basement light, shaking off museum dust. On the mezzanine level is the Met’s collection of Etruscan art—along with a state-of-the-art study gallery containing secondary objects—whose showpiece is a chariot from the sixth century B.C. decorated with scenes from the life of Achilles. The chariot is both a scholar’s delight and a boy’s dream. Most presentations of classical art look bloodless: too many stiff poses, too much white marble. “The Greeks,” de Kooning liked to say, “hid behind their columns.” Of course, the ancients actually painted their marble, often with a kind of vital, garish delight. The new galleries convey better than the earlier ones did that existential tang. (The ghostly and Platonic are fascinating, but someday I’d love to see a serious show that captures the chaotic visionary impulse of classical civilization: something mad, color-drenched, and Dionysian.) Off the main court are galleries, filled with domestic objects, that include the two magnificent bedrooms the Met owns from villas near Pompeii. One is a celebration of profusion—all vivid color and playful perspective—the other an elegant study in minimalist black in which small diaphanous landscapes float dreamily in the darkness. The difference between the rooms conveys, pungently, how varied style and fashion could be in the Roman world. The fresco from the reception hall of the villa at Boscoreale contains, incidentally, one of the most powerful images of a woman in the museum. She’s an undainty bride, boldly painted, firmly planed, who rests her head on one hand and stares thoughtfully into the distance. She has a presence as forceful as that of Picasso’s Gertrude Stein. The installation seems very stable—an indication, I hope, that after agreeing to return the Euphronios krater to Italy, the Met will not be sending back many more classical works. Yes, looting must be stopped. Yes, art often looks best in situ. But no, Italy does not need the Euphronios krater. The patrimony of the ancient world does not belong, except in a vulgar literal sense, to this or that modern country: Dispersing art from varying cultures around the globe is illuminating. (In an ideal world, the Met would keep the krater and send Italy an important American work of art.) It’s remarkable that Americans can now confront classical culture as fully as they can in what the Met is rightly calling a “museum within a museum.” The galleries will be good for students, good for scholars, good for connoisseurs, good for Byronic dreamers. The new court will become, in particular, an ideal place to spend a thoughtful moment. In a cramped city, a substantial interior space generously filled with natural light turns into an unexpected gift, like a garden you come upon unawares. The statues are still. But the light moves. This will be my last regular column for New York. After more than ten happy years here, I feel the need to stretch. (Besides, a critic ought to present a moving target.) I’m delighted that Jerry Saltz is coming to New York, and while I try to write my books, I hope to make frequent contributions to the magazine. It’s a good omen, I think, that the Greek and Roman galleries are opening just as I am leaving. I like ending at the beginning. In 1870, the Met acquired its very first work of art—an ancient Roman sarcophagus—though it didn’t make it to the museum till around 1874. The large marble coffin, which dates back to A.D. 200 to 225, was found in Turkey in 1863 and is decorated with Medusa heads, garlands of oak leaves, Cupids, and Victories. The sarcophagus was first exhibited at the Met’s old location on West 14th Street. At one point, it even served as a collection box into which visitors could deposit coins. The Metropolitan Museum of Art. Opens April 20.